As a former elite athlete, I turn into a horrible, condescending jerk when I watch the Olympics with armchair fans like you. 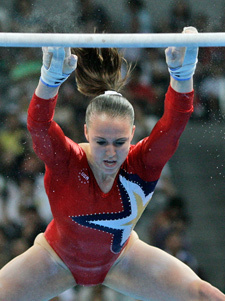 U.S. gymnast Chellsie Memmel loses her grip on the uneven bars during the women's qualification rounds at the Beijing 2008 Olympics in Beijing, Sunday, Aug. 10, 2008. I am the most annoying person to watch the Olympics with. I'm a condescending former elite athlete who loathes the armchair fan. I love sports. I love athletes. I hate fans. I'm especially annoyed by those who believe their dalliances in amateur childhood athletics give them insight into the travails and accomplishments of Olympic athletes. Watching the women's 400-meter individual medley with some friends, one lesser-known acquaintance gently whispered to her daughter, "Mommy swam the 400-meter freestyle in high school." See? I'm horrible. But she didn't. Technically, she stayed afloat. She swam back and forth in the pool. But her interpretation of this flywheel-type movement surely had nothing to do with what Britain's Rebecca Adlington brought to bear on that pool in Beijing. Adlington was fourth when the race was nearly 90 percent complete and she dug deep down to deploy a furious kick and overtake the United States' Katie Hoff, who had led the entire race to that point. That's swimming the 400-meter freestyle. Until recently, I've kept my gymnastics past to myself. For several reasons, not the least of which is that it is irrelevant in today's grown-up world of kid raising and professional responsibilities. Another reason is that it unleashes a vile condescension that I prefer to keep under wraps. But since I decided to write a book about my experiences as a gymnast in an effort to lock all the demons away, everyone I encounter on a daily basis now knows about my childhood history. One co-worker approached me in the cafeteria after the women's preliminary gymnastics event. Having read my book, she squealed, "I was a gymnast too!" Her me-too exuberance brought that ugly lady to the surface, the one I've tried so hard to conceal by denying she exists. Ashamed, I tried to eclipse my smug antipathy with a smile and an oh-really nod. You loved Nadia and begged your mom to sign you up for gymnastics classes. You went two days a week until you were in junior high. But then your body developed and boys noticed and hanging out at the mall or trying out for the cheerleading squad seemed a lot more appealing than spending the afternoon in a chalky, musty gym scared out of your wits to do what the coach was demanding. I was practicing 12 hours a week by the time I was 7, traveling up and down the New Jersey Turnpike each weekend for competitions. I moved away from home when I was 14, trained 40 hours a week while attending high school, endured untold abuses by overenthusiastic coaches who weighed me twice a day to make sure I didn't inadvertently get fat during my seven-hour practice. I broke my femur at the 1985 World Championships when I fell from the uneven bars on my last event of the competition. My parents ignored my depression and starvation, assuming I was happy because I won medals. See what I mean about this woman inside being horrifically ugly? As much as viewers love watching these athletes defy human expectations, I'm not convinced that those who haven't ever endured the trials and brutal training regimen required to compete at the Olympic level really understand what is entailed. In watching a sport like gymnastics it's easy for a viewer to see that she couldn't perform a double twisting double back like Shawn Johnson on the floor exercise. But in sports like swimming or track, where the athletes are engaged in activities that regular people do all the time, I think there are many who believe it's simply a little extra commitment that sets these athletes apart from the hoi polloi. I get the feeling that regular folks believe that if they just had the heart to stick with it through 10th grade, they too would be celebrating on the medal stand in Beijing along with Michael Phelps and Dara Torres. But maybe I'm defensively projecting. When watching water polo all I can think about is how hard it is as a not-so-thin, barely fit woman to tread water for more than two minutes. These Olympians do it for more than half an hour as easily as mortals stand on the ground. They kick in the water to keep themselves afloat without a rise in pulse rate, without getting even the slightest bit tired, without any thought whatsoever. They do it unthinkingly while they beat the crap out of one another and score goals. Do Olympic fans understand how unimaginably hard it is to overcome fear, persevere through injury, come through in the clutch, give up one's entire life in the name of a few possible yet unlikely moments of glory? How devastating it is to be Chellsie Memmel, the 20-year-old former world champion gymnast who missed qualifying for the 2004 games, then gave up the past four years of her life to go to Beijing, only to compete in one event because of injury. And then fall. A lifetime reduced to 30 seconds of what must feel like failure. I'm going to put the unsightly former athlete back in her closet where she belongs and watch agog at the rest of the games. And I will watch alone, where I can't offend anybody by acting like a total jerk. Jennifer Sey is the author of "Chalked Up," her memoir about the ups and downs in internationally competitive gymnastics. She was the 1986 U.S. National Champion and a seven-time national team member.